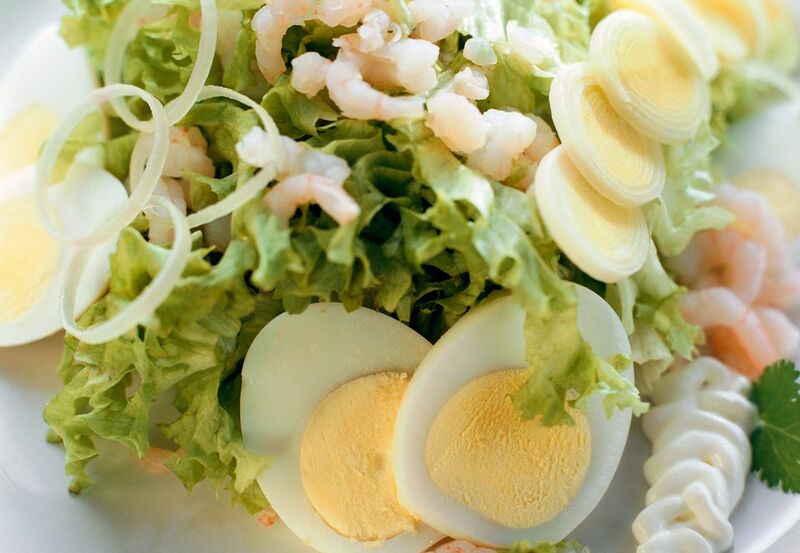 Shrimp Louis salad is a variation of Crab Louis. It's a lunch staple at traditional restaurants and many families also enjoy it as a Christmas Eve tradition. This shrimp salad made with tomatoes, hard-cooked eggs, and a Louis dressing of mayonnaise, chili sauce, and parsley. Also spelled Shrimp Louie, it's always pronounced in the French way, "loo-ee," the origins of this salad are from the West Coast in the early 1900s. The original formulation features Pacific Northwest Dungeness crab and it may have been named after Louis Davenport of the Hotel Davenport in Spokane, Washington, where it is still on the menu today. But the Olympic Club in Seattle and the Solari's restaurant in San Francisco are likely candidates. Famed gastronome James Beard remembered enjoying it in Portland, Oregon, in his youth. The shrimp version is common in Oregon, where the local small bay shrimp are used. These are easily available pre-cooked in most supermarkets. You can also use larger frozen or fresh shrimp. To cook shrimp to add to the salad, you can saute them or broil them. See how to devein shrimp to remove the black gut line that can have grit. You'll also need hard-boiled eggs. Combine all of the ingredients for the Louis dressing and chill it until serving time. Wash the lettuce and pat dry or use a salad spinner to remove any water. Tear the lettuce into your desired segments. Some people prefer smaller, some larger. Arrange the lettuce on chilled salad plates. Slice the eggs into sections. Cut the lemon and tomato into wedges. Place shrimp on lettuce then garnish with tomato wedges, hard cooked eggs, olives, and lemon wedges. Spoon the Louis Dressing over shrimp. Note: This recipe will make two meal-sized salads or four smaller salads. You can use different types of lettuce. Iceberg lettuce is often used. For convenience, you can use a packaged salad mix if you prefer. Other vegetables often arranged on top of Louis salad include cucumber, marinated asparagus spears, artichoke, avocado. Sometimes the dressing is mixed with the salad greens right before serving rather than served on top. The dressing can also be served on the side. Sometimes Thousand Island dressing is used rather than Louis dressing.